Team charter canvas - Free Download - Business Models Inc. So, you've gathered a team of unusual suspects and diverse characters. How will you agree on your goals, expectations, and values? And how will you deal with challenging situations? Design a team charter together to avoid unnecessary counter productivity or unwanted surprises. And basically, it is good to know who you are traveling with! The Team Charter Canvas was created by the Design A Better Business Team based on ideas developed at CCA. Let everyone do a short introduction. The person speaking should be standing. Another way is to have everybody make one simple visual of who they are, what is important for them, and what they strive for. This is a great way of getting to know each other and for breaking the ice! You don’t always get to decide with whom you work with. Even if you do, there’s no guarantee that you’ll be successful. Conflicts of interest and differing values or goals often get in the way of a team’s progress. 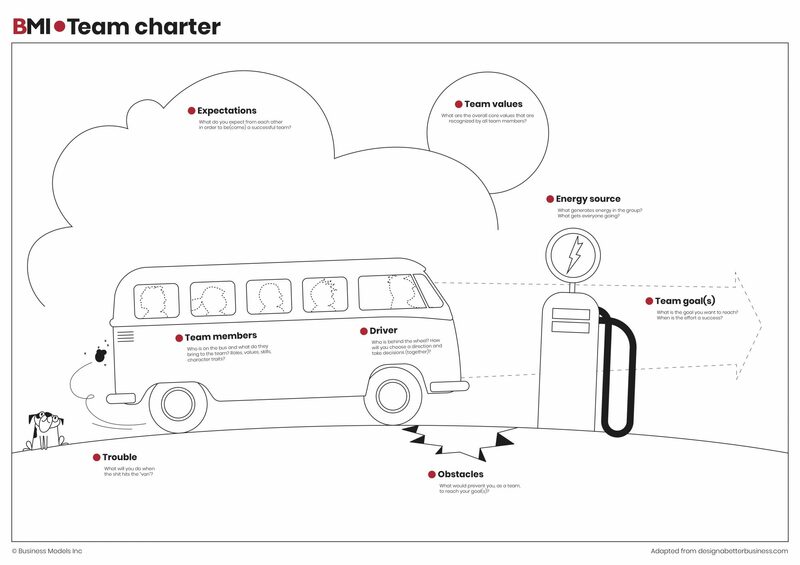 A team charter will help you create a blueprint for the engine behind a project: a well-balanced team. As a co-created document, the team charter will help clarify the team’s direction while establishing boundaries. As mentioned it is very important that everybody is introduced properly, that people know what everybody’s expectations are (why they are in the room) and that there is a relaxed atmosphere. If there are things preventing this, make sure they are dealt with up front. Ask every team member where they want to sit on the bus. If someone wants to sit in the driver’s seat. That’s great! More room for you as a facilitator to facilitate! Individually people need to write on sticky notes what their expectations are (max 3), what they see as obstacles (max 3), their 1 most important value, and what will give them energy. Also, each should write down his or her most important value they want to add to the group.There is no right or wrong. It is about finding the common ground and goals of the team. Take a step back and have a discussion about the values expectations, values, energy sources, and obstacles. Again it is not a discussion about right or wrong, but about making sure they all can identify themselves with what is put on the charter. Either the team as a whole will come up with common input. If not, the sum of the sticky notes is what the team represents. TIP! Focus on one subject at a time. When every member has explained their input, only then move to the next topic. When clustering the sticky notes per topic. Overarching themes may arise. This is great, but should not be forced. Don’t try to be too practical here as a facilitator. Now that everything is filled in an everybody recognizes themselves as an acknowledged and valued team member, let’s fill in the team goals! The team should discuss and come up with a maximum of 3 goals. Make sure they are not all directly related to their functional goal. After the session is finished, have all team members sign the team charter canvas. It is their contract amongst each other to make the team successful.